From the author of Summer Snow--a suspenseful, breathtaking novel about true love, starting over, and finding the truth...at all costs. Danica Greene has always hated flying, so it was almost laughable that the boy of her dreams was a pilot. She married him anyway and together, she and Etsell settled into a life where love really did seem to conquer all. Danica is firmly rooted on the ground in Blackhawk, the small town in northern Iowa where they grew up, and the wide slashes of sky that stretch endlessly across the prairie seem more than enough for Etsell. But when the opportunity to spend three weeks in Alaska helping a pilot friend presents itself, Etsell accepts and their idyllic world is turned upside down. It's his dream, he reveals, and Danica knows that she can't stand in the way. Ell is on his last flight before heading home when his plane mysteriously vanishes shortly after takeoff, leaving Danica in a free fall. Etsell is gone, but what exactly does gone mean? Is she a widow? An abandoned wife? Or will Etsell find his way home to her? Danica is forced to search for the truth in her marriage and treks to Alaska to grapple with the unanswerable questions about her husband's mysterious disappearance. But when she learns that Ell wasn't flying alone and that a woman is missing, too, the bits and pieces of the careful life that she had constructed for them in Iowa take to the wind. 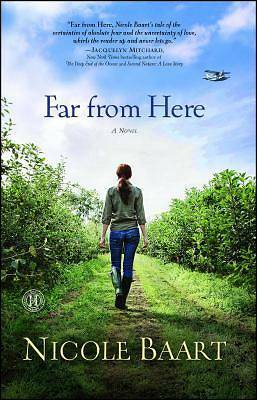 A story of love and loss, and ultimately starting over, Far From Here explores the dynamics of intimacy and the potentially devastating consequences of the little white lies we tell the ones we love.